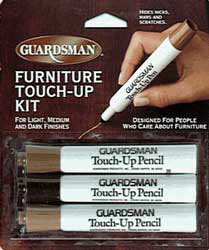 Guardsman Touch-Up Kit contains the same special formulation of dyes which is used by furniture manufacturers and dealers in their factories and showrooms for quick permanent touch-up. Colors blend with most fine furniture finishes. Single Kit-3 colored pens-light, medium and dark to match most furniture finishes. Hides nicks, mars, scratches and worn edges. Tough, colorfast & long-lasting colors, dries in seconds! 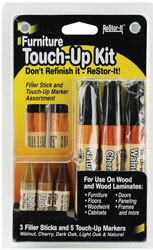 3 Filler Sticks for wood finishes in: - Light - Medium - DarkFill in stains to restore beauty to furniture quickly and easily. Use Touch-Up markers to conceal minor, worn edges, blemishes and imperfections.